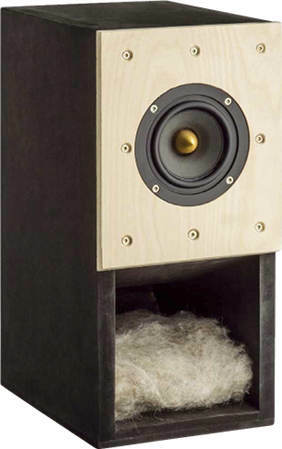 The CT 256-655 is a bookshelf hornreflex speaker with Tang-Band W4-655 (golden phase-plug) fullrange speaker. CT 256-655 has been developed by Thomas Schmidt. The crossover is a serial wave trap to smooth the frequency response between 400 Hz an 3000 Hz. The frequency response is balanced. At low volume, i.e. 85 dB at 1 m, the nonlinear distortions are lower than 1% above 400 Hz and rises not over 1,5% at 95 dB at 1 m .
The high-end kit comes with a ClarityCap SA capacitor of high quality. The inductance is a baked varnish air core coil for minimizing microphonic effects. - The current flow through the coil creates a magnetic field which sets the reel of wire in motion. This motion induces a voltage in the coil which adds itself to the signal. The stiffer the reel of wire is, the less the signal will be altered.